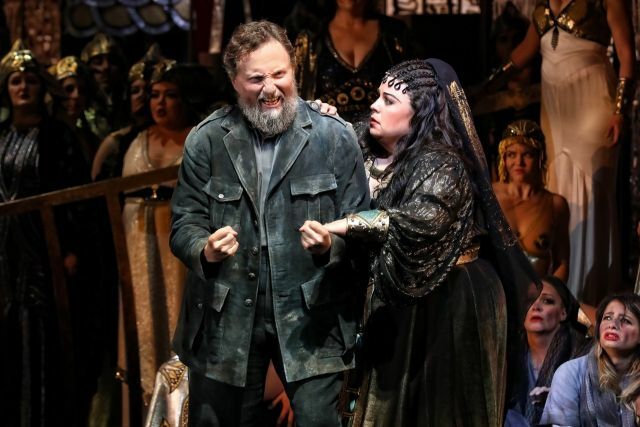 Opera Australia blasted into the digital age with a new production that amplified the spectacle of ancient Egypt through the use of giant LED panels, which moved and spun around the stage, creating a giddy spectacle. It depicted a smorgasbord of moving images, ranging from an ominous giant panther, to a rider on a horse back charging through a desert and an extraordinary golden snake, which wrapped its slithering leather around the entire backdrop of the stage. This production is a vision of Opera in the future – using the latest technology to make it an experience closer to film than the traditions of set and costumes, established in centuries past, when most of the cannon was composed. For this Opera Australia deserves congratulations. However it must be said that the director/choreographer Davide Livermore (a much lauded Italian creative – alongside an Italian set designer Giò Forma and Italian Video Designer D-Wok) pressed a little too hard on the accelerator. It was like someone had tossed them the keys to a new Ferrari and they felt obliged to give it an almighty rev. There were moments in the first act when the videography suffocated the narrative. The costumes (from Italian designer Gianluca Falaschi) too, featured a mix of genres. The King of Egypt – Jud Arthur - arrived on a chariot in full metal armour – part medieval knight / part tin man. Elsewhere buckets of gold were splashed around in more classic looking Egyptian regalia. Curiously the Ethiopian prisoners of war came onto the stage in bedraggled modern clothes. The props too were of mixed period, ranging from classic looking spears to modern couches. Thankfully none of the music was updated, under the baton of a 20 something conductor Andrea Battistoni (you guessed it from Italy). Most splendid was the sound of the horns, with members of the orchestra heralding the triumphal march from the audience. Don’t expect to see the traditional procession of animals in this production. The sound was glorious but this director was intent on doing things differently. Audience members had to see the elephants (a tradition in Aida) in their imagination. Mercifully the LED was not so adventurous after interval, with the screens supporting the narrative not competing against it. At its heart Aida is a love triangle. The Princess of Egypt Amneris competes for the heart of the country’s smartest captain Ramades with an Ethiopian slave Aida. Opera Australia imported international stars for the three key roles. 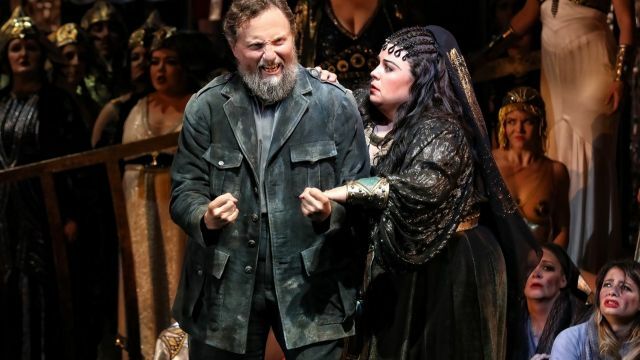 Amber Wagner (Aida) has an extraordinarily powerful voice. If you can sing like that, you don’t have to move much. Riccardo Massi was the complete package, a strapping looking and sounding hero. Elena Gabouri (Amneris) had a delicious sharp edge to her acting. One Australian principal, Warwick Fyfe, was equally formidable as the King of the Ethiopians. Overall this was a formidable international production full of visual splendour. Perhaps it is best seen from the back of the theatre where the imagery is not quite as overwhelming.